Find out more about this suite of utilities that allows testers to repair locked-out systems, restore lost data, remove malware, and much more. 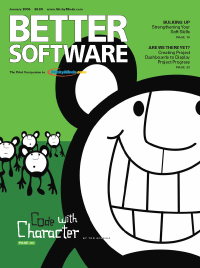 Better Software magazine and StickyMinds.com offer up readers' responses to our annual salary survey. Managers aren't mind readers. Translate vague grievances into concrete recommendations for generating change in your workplace. Create project dashboards to display project progress and drive your team to success. How can strengthening people skills, such as teamwork and communication, help shape you into a top-form tester? Use .NET generics to get to know your data types and form more meaningful, trusting, typesafe relationships with them.